Martin Scorsese returns to his childhood parish, the Basilica of Saint Patrick’s Old Cathedral for a conversation about how his youthful imagination was inspired by his church and his neighborhood of Little Italy. On Wednesday, November 14 at 7 PM, on the eve of his 76th birthday, Martin Scorsese returns to his childhood parish, the Basilica of Saint Patrick’s Old Cathedral on Mott and Prince Streets, for a conversation about how his youthful imagination was inspired by his church and his neighborhood of Little Italy. 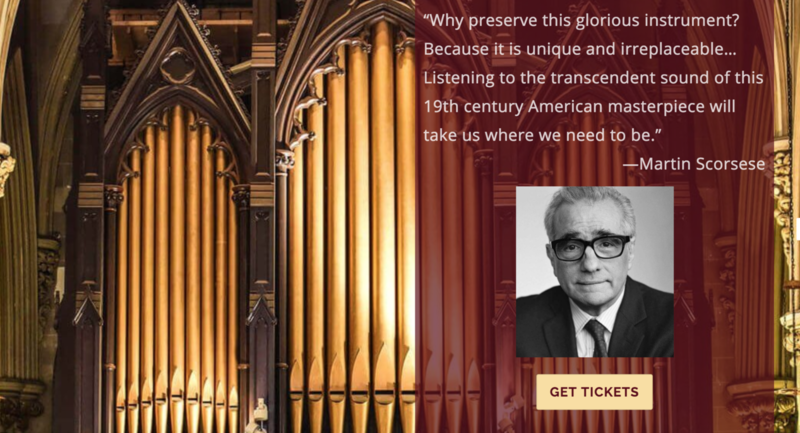 A noted preservationist, Martin Scorsese last year donated his 75th birthday to Friends of the Erben Organ, which must raise $2 million to restore and preserve the 150-year-old instrument, which is considered one of the most important in the nation. Basilica Music Director and Organist Jared Lamenzo will play a pre-event recital on the 150-year-old Henry Erben pipe organ: Suite for Organ Trio and Strings, by Josef Gabriel Rheinberger. Built in the early 19th century, the Basilica of St. Patrick’s Old Cathedral is over 200 years old and designated a New York City and National Historic Landmark. In 2013, the Basilica revived the Rite of Christian Burial in its historic cemetery and catacombs, becoming the only Catholic cemetery in New York City. With its recent renovation, unveiled in 2015, the Basilica is in a period of revitalization, of which the restoration of the Erben Organ is a vital part. Friends of the Erben Organ is a 501c3 formed in 2017, with the mission of restoring and preserving the Basilica’s historical 1868 Henry Erben organ and creating a community of music education and artistic performance around one of the most important historical instruments in the nation.